I just received a notice about the Royal Conservatory of Music (Canadian flute exam board in Toronto) that there will be some upcoming changes to the RCM flute syllabus. The new series will also include two studies books, a technique book, and orchestral excerpts will be published in 2010. The official launch will be at the NFA convention in Anaheim. Ooooh, amazing! Can't wait to see those! So now that the RCM books are out what do you think? I read online that the new books will be available at the NFA convention. Are they already purchasable elsewhere? I don't yet have them, do you? Yes they are available in most music stores. There are quite a few changes that have been made. Thanks, I'll get one and have a look. What do you think of the changes so far? But in my c# flute cork is 0.9 or 1 cm away from the centre of the emboucher.how? please explain me. 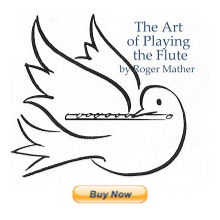 Sorry, is that a "C#" flute? If your flute's headjoint cork is in the wrong place, any flute repair person can fix it for you in five minutes for about five dollars or less.